This poor little creature had previously lived for years in a tank by herself with no sun and an improper diet. She was misshapen, with long overgrown toenails and a beak that would not close properly. Her lack of care and attention was a precursor to an early death. But Berry had class and grace, and had no interest in being ready for hospice. We had her nails trimmed and her beak aligned and she was beautiful again! Every so often, an animal comes into American Tortoise Rescue that touches us in a way that is so different, so life changing, that we are doubly blessed to have had the experience. That would be Berry, our tiny, deformed, spunky box turtle. 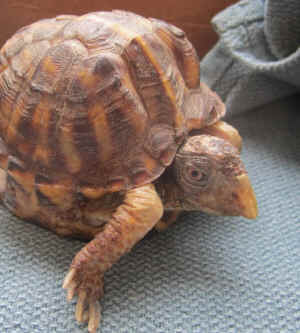 Berry came to us just under a year ago from California Turtle and Tortoise Club when it was decided that she needed hospice care, and we could best provide it. She joined the other turtles in our hospital who had suffered similar abuse: Spinner, a paralyzed turtle who went in circles so she needs help eating; Sushi who lost her feet to mites when an owner didn’t notice; and Potato Chip, a five year old box turtle who is incredibly small and deformed – the size of a 50 cent piece. Berry’s days were filled with sunshine, soaks, buddies and good food. Boy, she loved her worms and chased them with exuberance. She recently underwent surgery on her leg with her same spunky demeanor and made an amazing recovery. We bathed her twice a day and she hungrily ate worms and small bites of bananas. Nurse YoYo, our cat, babysat her when she was recovering making sure I took care of her properly. He was her devoted caretaker. Until today. Sometime during the night, she passed over the rainbow bridge. We don’t know why, but my guess is she was not able to metabolize the food that she was getting as she was the same size with little scrawny legs as a year ago at the time of her death. Berry, you brought joy and happiness to Marshall and me throughout the short time we were graced by your courage in spite of adversity. 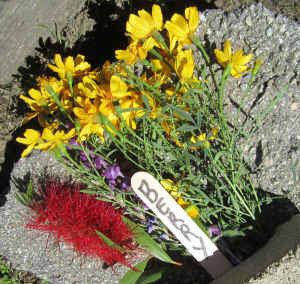 You will be missed, and I cry again now as I write this tribute to one of the bravest little turtles that I ever met. We will see each other again when we too pass over the rainbow bridge, and you will still be the beautiful creature we came to know. Thank you for being in our lives. You can make a tax deductible donation (TAX I.D. # 93-1219374) to the Berry Veterinary Fund in her memory by sending a check to Berry’s Fund, American Tortoise Rescue, 30745 PCH, #243, Malibu CA 90265. 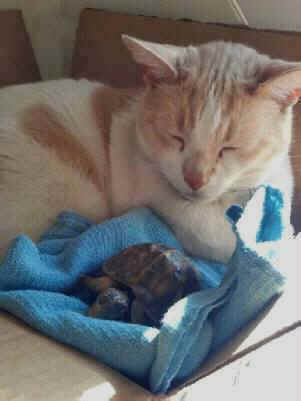 All monies will go to rescue turtle and tortoise healthcare and vet care in Berry’s honor. Bless you and thank you. And see how you can help on World Turtle Day, May 23, 2014. Visit their Facebook page.